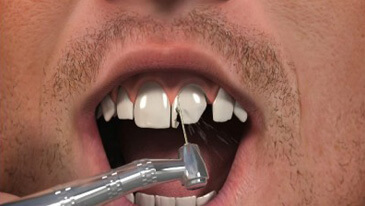 Dental composites are also called white fillings. These materials are similar to those used in direct fillings and are the colour of your tooth. Their strength and durability is not as high as porcelain or metal restorations and they are more prone to wear and discoloration. Many people still have silver/mercury fillings in their mouths from years past. These fillings are not particularly pleasing to the eye, and we know that by unavoidable design, silver/mercury fillings ultimately result in a weaker tooth structure. Porcelain inlays and tooth-coloured restorations create fillings that are not only beautiful (or unnoticeable), but also add strength to weakened teeth that has been exposed to a lot of decay. These restorations are aesthetically pleasing and very strong thanks to new bonding technologies. There are many advantages to tooth-coloured restorations. 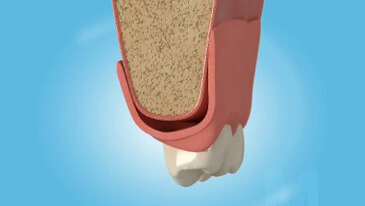 Resin onlays are bonded to the teeth creating a tight, superior fit to the natural tooth. 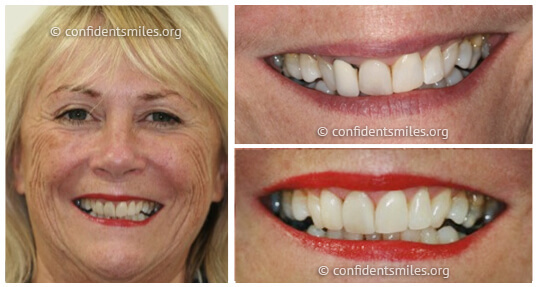 Such restorations can be used in instances where much of the tooth structure has been lost. The tooth remains intact and stronger. Since the resin used in tooth-coloured restorations contain fluoride this can help prevent decay. The resin wears like natural teeth and does not require placement at the gum line, which is healthier for your gums! Where damage to a person’s teeth is extreme, and apparently beyond repair, we can use porcelain or porcelain “fused on gold” crowns to make the smile appear “as new”. 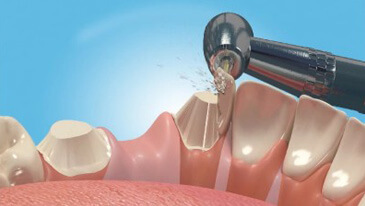 These treatments are used for a long lasting correction of major dental problems. It is usual for these treatments to last for 20 to 30 years, which is as close to permanent as dental treatment can get. We use the latest technology to reduce the discomfort to our patients and to offer them a single-day restoration visit. Chairside Economical Restorations of Esthetic Ceramic or CEREC® for short is a new state-of-the-art method of reconstructing tooth restorations. CEREC® uses computer-assisted design (CAD) and computer-aided manufacturing (CAM) to offer single-day restorations for patients. This new technology has revolutionized ceramic restorations such as crowns and veneers for patients so that there is no longer a wait between preparing the restoration and finally receiving the finished product. With CEREC®, the technology is used while you are sitting in the dental chair. The restorations created are metal-free and tooth coloured to restore your tooth to its natural beauty, strength and function. With CEREC®’s CAD-CAM technology, these ceramic restorations can all be done in one single visit to the dentist. Inlays and onlays can be made of porcelain, gold, or composite resin. These pieces are bonded to the damaged area of the tooth. An inlay, which is similar to a filling, is used inside the cusp tips of the tooth; an onlay is a more substantial reconstruction, similar to the inlay but extending out over one or more of the cusps of the tooth. They are suggested by a dentist when over ½ of the tooth’s biting surface is damaged. Traditionally, gold has been the material of choice for inlays and onlays. In recent years, however, porcelain has become increasingly popular due to its strength and colour, which can potentially match the natural colour of your teeth. A denture, is an appliance that is inserted in the mouth, replaces natural teeth and provides support for the cheeks and lips. Most dentures are made of acrylic and can be fabricated two different ways. There are two types of dentures: complete dentures and removable partial dentures. 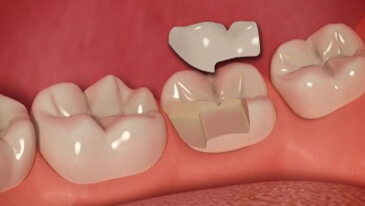 Removable partial dentures usually consist of replacement teeth attached to pink or gum-coloured plastic bases, which are connected by metal framework. 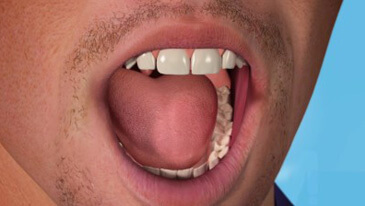 Removable partial dentures attach to your natural teeth with flexible, gum coloured clasps Consult with our doctors to find out which type is right for you.